Rodeo trail riders are feeling the pinch of rising insurance rates. HOUSTON (KTRK) -- Insurance is a required part of life. 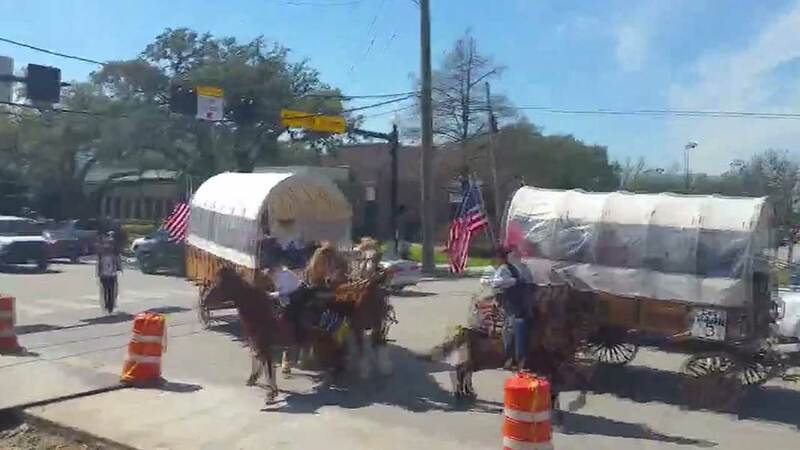 Houston trail riders are also required to carry insurance if they make the ride into the city from different parts of Texas, some of them even crossing state lines. Riders are concerned about how much their premiums may rise next year. Last year, a high-profile incident saw a trail rider struck by a runaway wagon team. The wheels of the wagon ran over her and her horse. Both rider and mount recovered, but the incident got the attention of the insurance carrier that wrote their policy. In a video supplied to Eyewitness News by a witness, you can see what appears to be horses get spooked and pull one of the wagons in the Los Vaqueros trail ride off course. The Houston Livestock Show and Rodeo CEO Joel Cowley issued a statement on Tuesday: "HLS&R evaluates insurance costs annually. Due to the timing of this trail ride premium increase notice, the Show agreed to pay the increase for 2017, and will re-evaluate for 2018. At this time no trail rides have notified us that they will not be participating in 2018." On the Salt Grass Trail Ride, considered the oldest and among the largest rides, dating back to 1954, Dicky Davis voiced concerns. "Everybody's trying to figure out what they would do. Right now, we have no idea what we're going to try and do, or what we would do if [a premium hike] does happen," Davis said. He added that the increase underwritten by the Livestock Show was ten times what they paid before last year's accident. On the Southwestern Trail Ride, there was a different take. Its president said the increase would amount to about $35 dollars in addition to what riders already pay. "I think it's a good deal," said James Middleton. "We need to be covered. If anyone gets hurt we need to be sure someone is responsible for the one who did get hurt." HLS&R did not provide any numbers regarding the increase because it is negotiating with the insurance carrier.